This post continues my discussion of the “One” music project from PS Audio. 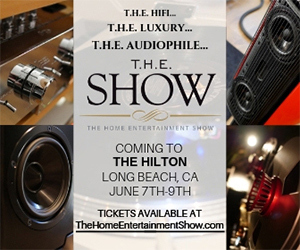 I regard the project a highly laudable effort to bring well-recorded music to the audiophile marketplace and assist the musicians, producers, and engineers. However, it was recorded using a Sony DSD 64 Sonoma system, a very old and outdated recording platform. 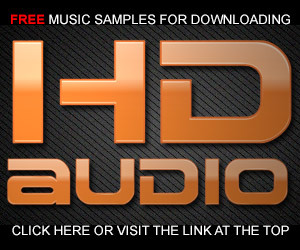 The files I paid $35 dollars for were upconversions of those original DSD 64 files to 176.4 kHz PCM files. I talked about file conversions previously…there’s no benefit to the end user. The fidelity of the original file doesn’t benefit from being jacked up to 176.4 kHz and 24-bit words in the PCM format. My criticism is centered on the myth that selling a 176.4 kHz file added to the fidelity of the original master. It doesn’t. But the end user gets charged for a bigger file, has to download a bigger file, and has to store a bigger file. My recommendation would be to downconvert the album to 48 kHz/16-bits…the fidelity will be the same and you’ll save a bunch of memory. Paul writes “just because the noise floor is rising doesn’t mean the signal level is falling”. He’s right. But the rising noise obliterates any possibility that those high frequencies will ever be heard. The effect is called “masking” and it’s a very common phenomenon. Think of a wave machine generating the soothing sounds of the ocean to block out obnoxious sounds that might keep you awake. If there are any high frequency components to be heard in these tunes, the DSD induced noise “masks” them completely. When the advocates of DSD 64 and SACD claim a frequency response of 100 kHz, they usually forget to mention that it comes with 6 dB of dynamic range. Thus the reason for the noise shift. Figure 1 – The rising red line “masks” any high frequencies that are present in the source DSD recording. The level of high frequency noise IS a real problem for real systems. 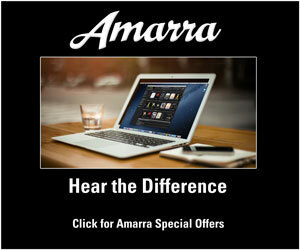 Manufacturers have two choices in dealing with excessive high-frequency noise that happens with DSD. One option is to roll it off using a filter (either analog to digital during the playback). This begs the question; Why would anyone want to download a file full of stuff that’s ultimately going to be rolled off later? The noise and 176.4 kHz sampling rate doesn’t contribute anything to the fidelity of the music…so why bother using that very high sampling rate? The second option is to pass the entire signal to the reproduction system — including the ultrasonics — and let the chips fall where they may…obviously, this is not a viable option. Our ears may not hear the ultrasonics but the equipment will. The next question is, “could his systems take higher levels of signal in the upper frequencies than DSD uses? Paul assumes no but in fact, the answer is yes. PCM at 96 kHz does offer an additional octave of ultrasonics before the reconstruction filters begin to remove any information. Frequencies that are not “masked” and might have a role to play in the enhanced sound of high-resolution music. The use of 96 kHz does contribute to the sound because of gentler filters and moving the pre and post-ringing to near 48 kHz. The argument over which format is best is actually pointless. The world is dominated by PCM and will remain that way for the rest of my lifetime and probably far beyond. My point in providing the spectra in the previous article was to show that downloading a very large file that contains a significant percentage of noise makes no sense (other than to brag about a 176.4 kHz sampling rate). Just give me that part of the file that contains music and forget about including the noise. I think the “One” recordings are excellent and I enjoyed most of the tunes. My criticism is about the use of 176.4 kHz to deliver fidelity that would have identical at 48 kHz. 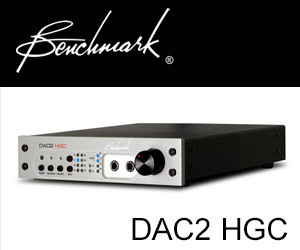 Don’t fall for the DSD hype…it’s not “warmer” or “more like analog”. PS I received a number of private emails that told me to forget about spectra and left brain technical analysis of music. 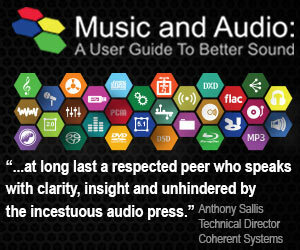 All that matters to many audiophiles is the richness of the playback…if that’s enough for them, great. It’s not enough for me. The fact is the entire industry’s production chain is built around and optimized for PCM. Even if a new format came around that could truly offer slightly better fidelity or make DAC design easier, it will still have to ultimately transcoded from PCM or it is a non-starter in my book. One of Sony’s biggest mistakes with DSD had nothing to do with the format’s bits and bytes, but rather the fact that they never really addressed the issue of how the production chain would be migrated over from PCM to DSD if the format ever took off. There are (were) native DSD DAWs but AFAIK they were insanely expensive and hard to use. Thanks Alex…DSD is not ready for the commercial music business, doesn’t sound better, creates files that are too big, etc. Those are the facts. Mark, I’m tempted to think that if you’d been around in the current manner 30 odd years ago when the snake oil merchants began rolling into The HiFi world, the industry would be far more straightforward and not populated by self appointed audio mavens with dubious theories and credentials. I just wish the industry would take a look at itself and recognize how off putting it is to newcomers. You have always struck me as someone who likes to keep things simple and this is absolutely how the audio business needs to promote itself to a wider audience. DSD was just an archival format for older recordings – nothing more. You mentioned in a post that in the use of a higher resolution format, 96/24 I believe, the entire recording/playback chain including speakers must be able to reproduce the full range of the original acoustics, whether or not one can actually sense the full range. Your graph shows that the recording you made contains frequencies up to 45kH. Do the speakers that you use reproduce that full range accurately? If they do not, can you be certain that you and others cannot detect those super high frequencies, in music and other sounds? I have several sets of speakers in my main studio. The surround set that I used to mix all of my releases are B&W 801 Matrix IIIs, which aren’t capable of ultrasonic reproduction. I have heard my tracks on the M2 JBL Studio Monitors, which top out at around 40 kHz. Can’t say that I heard a difference but I enjoyed the sound very much. As usual, Mark, thanks for the discussion and no-nonsense demonstration. It really is remarkable that they did the DSD64 conversion to 24/176.4 without implementation of a reasonable roll-off filter down around 30kHz or so. 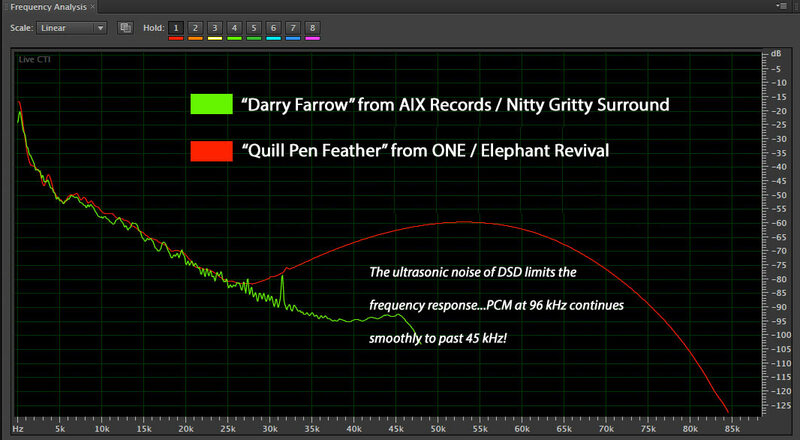 That’s a substantial amount of ultrasonic noise up in the 50kHz range… Professional tools like Weiss Saracon has the good sense to implement the roll-off much earlier, likewise for software like default JRiver when they do DSD-to-PCM conversions. As you say, even if we cannot hear it, our equipment likely will. And even if subtle, this amount of noise could be contributing to intermodulation distortion and other nonlinearities… I actually would not be surprised if some people might misinterpret these effects as “detail” captured by DSD. It is what it is. Even if one argues that the noise is imperceptible, why even bother with such a compromised technology that is DSD64? The music itself not withstanding (which I’m sure is great artistry), in 2016, I’m amazed that anyone would consider the SACD/DSD64 technology could showcase “the single best demo disc”. If they wanted to stick to DSD, at least do the recording in DSD128 or DSD256 and produce some really nice 24/96 and 24/192 PCM out of that while downsampling to SACD. Keep up the great work, Mark and keeping your cool :-). I have been watching you on Youtube the last few days in various videos filmed during audio festivals and seminars and I learned a lot. The only thing I am still unclear about is the conversion from 24-bit word length to 16-bit word length. Does anything get lost in the process that would have some kind of effect on audio quality? Thank you in advance. There was a Press Release from Samsung the other day that announced the introduction of UHQ-Audio. I hadn’t run into this format previously so I was amused to find Samsung pushing it as an upgrade to 32-bit audio. It’s Ultra High Quality Audio. Never mind that commercial recordings — even audiophile ones — don’t have 32-bits of resolution and there isn’t any human audible experiences that exceed 24-bits. It’s the same bigger number or new acronym nonsense. Bring out a new encoding format like MQA or add 8 more bits to the basic word and then market the hell out of it in the hopes of gaining some market share. The recordings that are released — both new and old — do not benefit from any of these schemes. The announcement that TIDAL is offering “Master” files is marketing BS and those that claim to hear more clarity and more definition are lying. Beware. Until the labels start making and releasing better tracks, we’re stuck with marginal fidelity. Moving from 24-bits during production to 16-bits for distribution simply narrows the dynamic range or raises the noise floor. But if the source recording didn’t use all 24 or even 16-bit (and virtually none do), then conversion is harmless. As usual you hit the format comparison conflict nail right on the head. Your commentary and graph analysis should be considered scientific fact, peer reproducible, case closed. Thanks again for your great text and Demo BR. I have read it a few times, and passed it on to a few budding young audiophiles. I have brought along my AIX BR collection and it has been fun to demo true 24/96 PCM.